Triceps brachii, the only muscle of the posterior compartment of the arm, is extensor of the forearm.It consists of three muscle bellies or heads: the long head origins from the infra-glenoid tubercle of the scapula;the lateral head from the posterior side of the humerus, proximal to the radial nerve groove; the medial head from the posterior side of the humerus, distal to the radial nerve groove and from the intermuscular medial septum. All the muscle heads converge to a single tendon, which inserts onto the proximal surface of the olecranon process. Triceps tendon tear is a relatively rare injury and the rupture of the distal triceps is the most uncommon rupture in the upper extremity.Namely less than 1% of all the upper extremity tendon injuries..Rupture is often associated with pre-existing systemic conditions or drug treatments, including the local or systemic of steroids or systematic endocrine disorders, renal failure, anabolic steroid use, local steroid injection.Patients tend to be men who practice sports and are from 30 to 50 years of age. Injury is commonly caused by falls on an outstretched hand, direct trauma on the elbow,lifting against resistance or sometimes it occurs after a surgical procedure where the triceps was reattached. 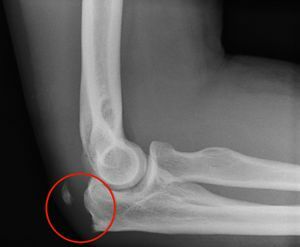 For example some case reports confirm triceps ruptures after following total elbow arthroplasty.The clinical examination may detect pain, a palpable tendon gap, and extension weakness, while a pathognomonic flake sign may be seen on radiographs.The patient describes often an unexpected “pop” or giving way. Subsequently the patient has pain and weakness in the extremity. Magnetic resonance imaging is widely accepted as the gold standard to evaluate the size and extension of the tear: triceps lesions often occur at the tendon insertion and result in either partial or total tears. The degree of the extension (partial or total). The time (acute or chronic). A patient with a triceps rupture can have posterior elbow pain, triceps weakness, a swelling and a palpable defect in the tendon. When the patient is unable to extend his arm against gravity, you can expect a complete triceps rupture. A palpable defect is not always present, but sometimes can be found in the posterior arm.Discerning between partial and complete ruptures can be a diagnostic challenge.The test to evaluate the triceps function is performed by the therapist with the patient in the prone position with the elbow flexed to 90°, the upper arm supported and the forearm hanging free. A partial tendon lesion is manifested by weakness, and the ability to actively extend the elbow is limited against the gravity but not against resistance. This finding is likely secondary to an intact lateral expansion or a compensating anconeus muscle. A total tendon tear is manifested by loss of extension strength against gravity, and the elbow extension against resistance is impossible. Also, the triceps extension tests can be performed observing the ability of the patient to extend the elbow over his\her head, against gravity. 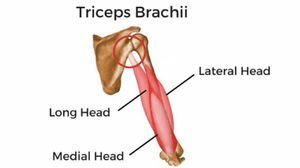 We have defined a test for triceps insertion tendon rupture called “fall down triceps test.” This test assesses the inability of the patient to keep the forearm in extension against gravity. The patient stands up with the shoulder at 90° of abduction, and the examiner stays behind and keeps the forearm in full extension. The forearm falls down when the examiner leaves the forearm, if the triceps tendon presents a complete rupture the forearm drops to 90° of flexion, for partial ruptures the patient is able to keep the forearm at 40°–50° of extension. 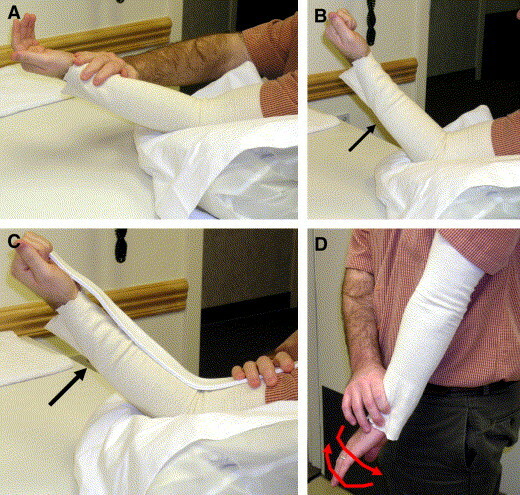 When the patient has a partial rupture it’s often treated conservative by splinting the elbow for four to six weeks. The immobilization was followed by range of motion exercises. Six months after the injury, the full strength and ROM was achieved. 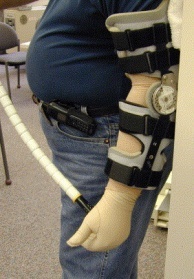 A hinged splint can be used after triceps repair if early controlled motion is desired. This splint blocks elbow flexion on the one hand, on the other hand it allows dynamic/gravity assisted elbow extension. The goal is a progressive elbow flexion by weekly advancing the range of motion block. So this splint allows passive elbow flexion and active elbow flexion through a range which is defined. When the patient is not exercising , the splint is locked in one position. In this phase patient education is also very important. The patient must be aware of the prohibition for active elbow extension, because this could lead to avulsion or rupture of the repaired tendon. For example : pushing himself out of a chair may not be performed by his operated arm. When the patient has difficulties with relaxing the repaired muscle or when he is untrustworthy during the performances of the exercises out of a protective splint, in this cases we use a dynamic traction splint. In this phase we can start with early controlled motion, whether the patient uses a static, hinged or dynamic splint. When the patient has a static splint it’s an absolute must that the patient is reliable, in other words the patient may not cross the limitations for range of motion or may not actively contract the repaired muscle. When the patient not obeys those rules, this might result in tendon rerupture. We can prevent this problem by using a hinged splint, because then there are blocks placed to limit end range and it also assists dynamic motion. * isometric strengthening for the hand and shoulder rotation, abduction and adduction.It’s very important to be carefully with an elbow flexion combined with end range of shoulder elevation because this will stress the triceps repair. Full-time immobilization is used for three to four weeks, if the patient follows not the ECM program because more protection for the repair is necessary . Six weeks after the operation , the patient begins with active contraction of the triceps. Elbow extension against gravity is definitely emphasized to encourage active motor recruitment rather then using the gravity to assist the extension. The strengthening starts with up to 50 % effort isometric contraction of the muscle tendon unit. The effort is determinated by measuring the maximal voluntary contraction (MVC) of the not- operated side with a hand held dynamometer and having the patient exercise up to 50% of MVC. We start the contraction in midrange and later we progress to the end range of motion. If the patient doesn’t develop pain, the effort is increased to the maximum. * positioning the forearm in supination, neutral and pronation to address all three heads of the triceps. 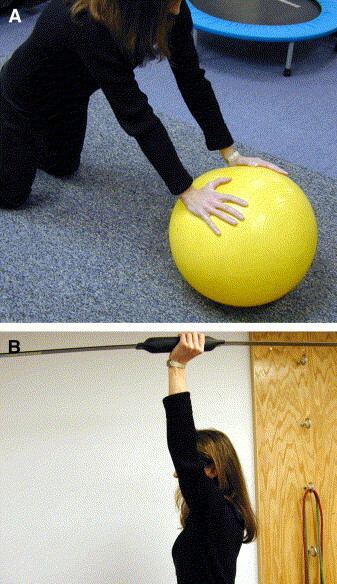 These two photos demonstrate exercises to complete the stabilization and mobilization exercises. If there’s a development of pain at the surgical site, the intensity of the strengthening program is immediately reduced. Sixteen weeks after the operation , sports-specific and work -specific activities begin. ↑ Williams PL, Bannister LH, BERY M, Collins P, DYSON M, DUSSEK J. MWJ Gray’’s Anatomy. ↑ Sollender JL, Rayan GM, Barden GA. Triceps tendon rupture in weight lifters. Journal of shoulder and elbow surgery. 1998 Mar 1;7(2):151-3. 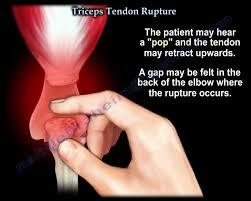 ↑ 6.0 6.1 6.2 6.3 6.4 6.5 Celli A. Triceps tendon rupture: the knowledge acquired from the anatomy to the surgical repair. Musculoskeletal surgery. 2015 Sep 1;99(1):57-66. ↑ Morrey BF. Morrey BF, Sanchez-Sotelo J. Functional evaluation of the elbow. The Elbow and Its Disorders. 2009. ↑ Blackmore SM, Jander RM, Culp RW. Management of distal biceps and triceps ruptures. Journal of Hand Therapy. 2006 Apr 1;19(2):154-69. ↑ Monasterio M, Longsworth KA, Viegas S. Dynamic hinged orthosis following a surgical reattachment and therapy protocol of a distal triceps tendon avulsion. Journal of Hand Therapy. 2014 Oct 1;27(4):330-4.